In Causeview an event is a special type of appeal, where your outreach efforts take the form of a one-time special event, like a gala, sporting event, or conference. Events have a lot of added features beyond a standard appeal in order to assist with your event planning and help you manage all of the associated extra details. When all of the event features are correctly saved in Causeview a paid or free event Actionpage makes it easy to process and track your constituents’ event registrations. An event can be created either under a parent appeal or directly under a campaign in the campaign-appeal hierarchy, depending upon your reporting and organizational needs. Remember that all gift and transaction amounts related to the event will roll up into its parent appeal or campaign. Navigate to the detail page for the parent, and find the related list for the Campaign/Appeal Hierarchy. To create a new event under the campaign or appeal you are viewing, click on the “New Event” button. 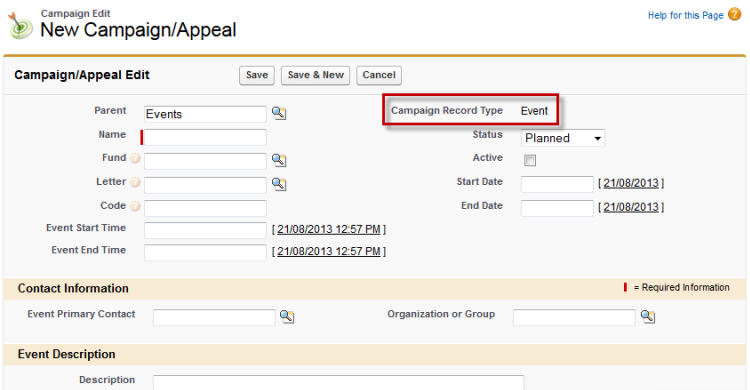 The new campaign/appeal page will open, and it will show options specific to event-type appeals. The campaign/appeal record type will be set to “Event”. Fill in all of the information that you can at this time. If event planning is still underway, you may need to come back at a later time to add details to the event - the only required information is the name of the event. Some information for an event is the same as an appeal. Create a distinctive name for the event, and select the parent appeal or campaign, the designated fund, an acknowledgement letter, a code, and a start and end date for the outreach effort. If the event outreach has already started or is starting now you can change the status and mark the event as active. Many information fields on the event creation page are uniquely applied to events. For example, if you know when the event itself will occur, you can enter the event start and end date. You can also include a constituent acting as the event’s primary contact. In the Event Description area you can describe the event and any required materials you would like to request internally. Under the Venue Details, specify the address where the event will be held. In the Event Publication Details area you can specify contact information which can be used in published or promotional material. If a speaker or presentation is needed for the event you can check the box in the Event Presentation Details and specify a date, time, and length for the presentation. The Attendance Details, Event Solicitation Analysis, and Event Performance Analysis sections will accumulate information as you send out invitations, receive responses from your constituents, and outline expenses. You can specify a budgeted cost to compare your projected and actual spending on the event, and a capacity for the event venue, but other fields in this area should be left blank. When you have completed all of the details that you can, you must save the event. You can click “Save” to move to the detail page for the event and continue setting up the event in Causeview. Event levels are very important if you are creating an event where attendees must pay to register for the event. If all of your attendees will register for free, no event levels are necessary, as you can use the “Free Event” Actionpage to process registrations, but for a paid event the event levels must show up on the Actionpage or Actionform for guests to register. This means that even if there is only one level for the event, and all guests will pay the same amount to attend, you must create an event level. To create a new event level, find the event levels related list on the event’s detail page, and use the “New Event Level” button. This will open the event level creation page, and will automatically fill in the name of the Event the level will correspond to. You can begin by specifying a name for the level, which will show up on the event registration Actionpage for your constituents to see. The status of the level is very important, as “On Sale” levels will appear on the paid event Actionpage for your constituents to see. Any other status will hide the level, so that your constituents cannot register for it. 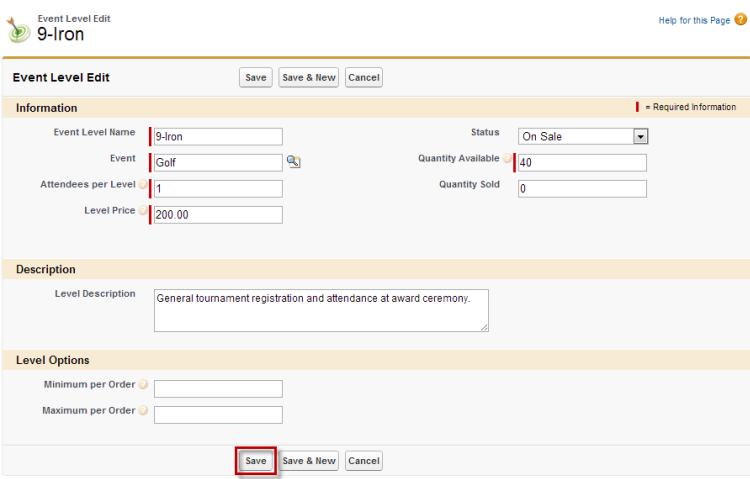 The Attendees per Level field is used to specify how many individual guests are granted access to the event when a constituent pays for one instance of an event level. This number will depend on how you are creating the event level. For example a “General Admittance” level may grant a single constituent access to an event, while a “Gold Table” level may allow eight people access to the event and give them a seat at a table. The Level Price will determine the amount your constituents will pay for each instance of the level. A portion of that price may not be tax deductible due to benefits included in the level package, which can be specified using event level benefits, while the remainder of the level price will be calculated as a tax deductible “gift amount” on the transaction. The Quantity Available specifies how many instances of the event level should be sold. The Quantity Sold should be left blank, as it will accumulate as your constituents register for the event, and a remaining quantity will be calculated based on these two numbers. The Level Description will appear on the event Actionpage when constituents hold their cursor over the information bubble for each event level. The Minimum and Maximum per Order can be used to specify the quantity of an event level that your constituents can purchase in one transaction. Once you have completed all of the information for an event level, make sure that the status is correct. Click on “Save” to complete the level and view the event level detail page, or “Save & New” to make a new level for the same event. Create all of your planned event levels, and check to make sure that the Number of Tickets Planned, which is based on Attendees per Level and Quantity Available, is the number of attendees you plan to have. In order to properly calculate the tax deductible amount for an event level purchase, benefits should be created in Causeview and linked to the event level. This must be done from the Benefit tab. Navigate to the Benefits tab, either in the top tab bar or through the “+” menu of all tabs. From the benefits home screen click on “New” to create a new benefit. The benefit creation page will open. On this page you can specify a Name and Code for your new benefit. 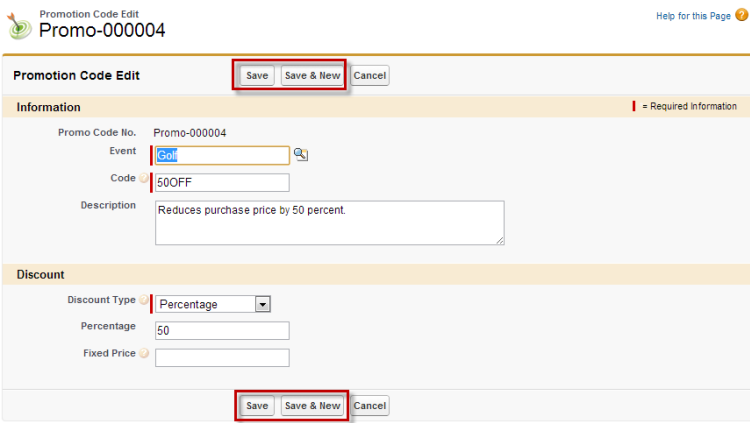 Select the Benefit Type that best represents the benefit, and fill in the Start Quantity of the benefit. The declining quantity of the benefit will calculate as they are distributed through event level purchases. The Benefit Value is the dollar amount used to calculate the non tax-deductible portion of an event level purchase. The Short Description for a benefit will show up on the event level benefit. The Full Description allows the use of rich text. Once the benefit information is complete you can save the benefit using “Save” or “Save & New” at the top or bottom of the page. Event level benefits are used to join the event levels to the benefits associated with the level. They allow you to connect one benefit with several event levels, from one or many events, and still keep an accurate count of the distributed and remaining benefit items. That means that they can only be created when both the event levels and the benefits have already been saved in Causeview. Event level benefits are created from the Event Level Benefits related list, which exists on the event level and on the benefit. It can be useful to work from the event level, to ensure that all of the levels for an event have the correct benefits. 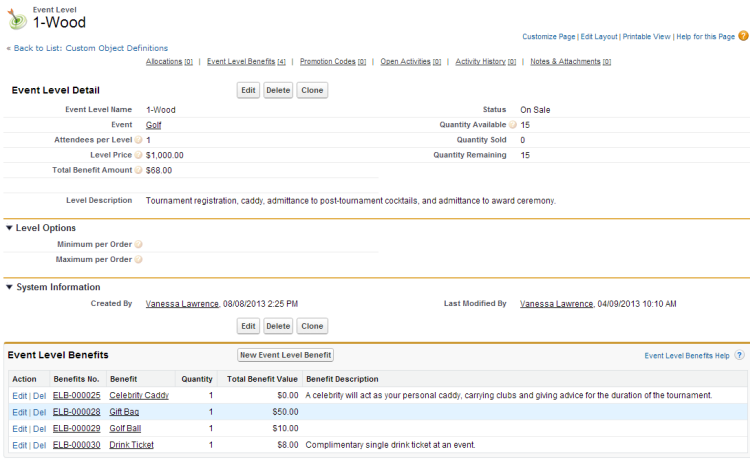 Navigate to the event level related list on the event detail page. Click on an event level name to open the detail page for that level. 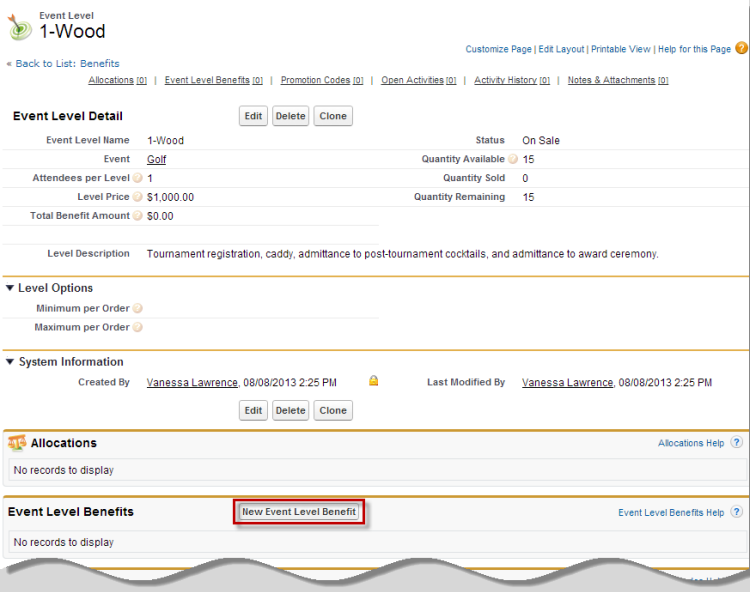 On the event level detail page, locate the event level benefit related list and click on the “New Event Level Benefit” button. This will open the event level benefit creation screen, with the event level set to the level you began with - in this case it would be “1-Wood”. No other information is required in order to save the event level benefit, but you can select an existing benefit and specify a quantity given for each purchased instance of the event level. The total benefit value will be automatically calculated based on the quantity and the value specified when the benefit was created. When the benefit information is complete, save it to Causeview. The value of all benefits for an event level will accumulate in the “Total Benefit Amount” for the level. It is best practice to create all of the event level benefits for the level before moving onto the next level associated with the event. Promotion codes are used to reduce the price to purchase and register for event levels either by a percentage or a fixed dollar amount. Promo codes apply to the total amount of a purchase, which may include multiple instances of several levels, and they do not impact the benefit amount associated with the transaction. To create a promo code, begin from the detail page for your event and find the Promotion Codes related list. Click on the “New Promotion Code” button. This will open the promotion code creation page. Here you can create a promo code, using any combination of letters and numbers, which your constituents can apply to paid event registrations to reduce their total purchase cost. The code cannot have any spaces or special characters in it. You must also specify whether the discount will be as a percentage or a fixed dollar amount, and depending on your choice, enter the amount. For example you could create the code “50OFF”, and specify that it is a percentage discount type. You will then have to enter the percentage value, 50, in order to save the promo code. If you choose to make a fixed price discount you must enter the fixed price amount in order to save. 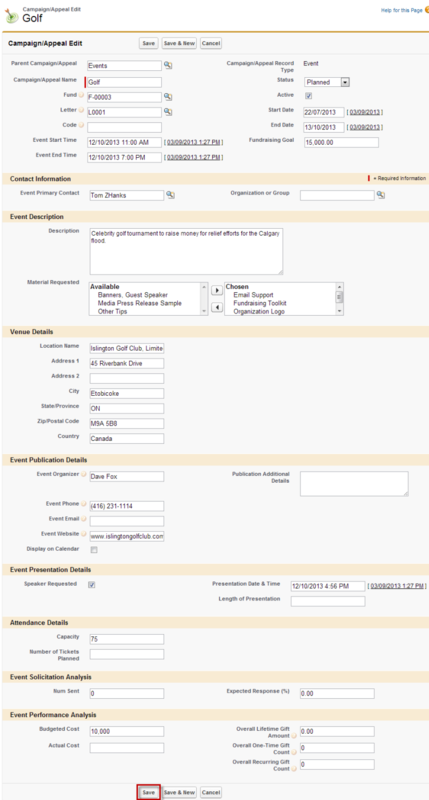 To give your constituents information about your event and to allow them to register for it, you can create an Actionpage using Causeview’s Actionpage Designer. Click on the “Actionpage Designer” button at the top of your event’s detail page.